The plant’s primary storage form of isothiocyanates like sulforaphane. Used by plants for their own defense. 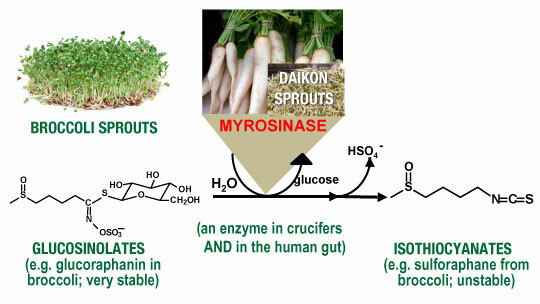 Converted to isothiocyanates by ‘myrosinase’, an enzyme that co-exists in the plant. Our gastrointestinal tract (our gut microbiome) also contains myrosinase, but at levels that we showed vary widely among people. This variability has profound implications for human health and cancer protection. Potential bioavailability of glucosinolates as measured by urinary excretion of metabolites after administration of a broccoli sprout extract rich in glucosinolates and expressed as percent of dose recovered. Each line represents a separate subject (A, Six healthy volunteers in Baltimore, USA. B, Twenty healthy, volunteers in Qidong, China.